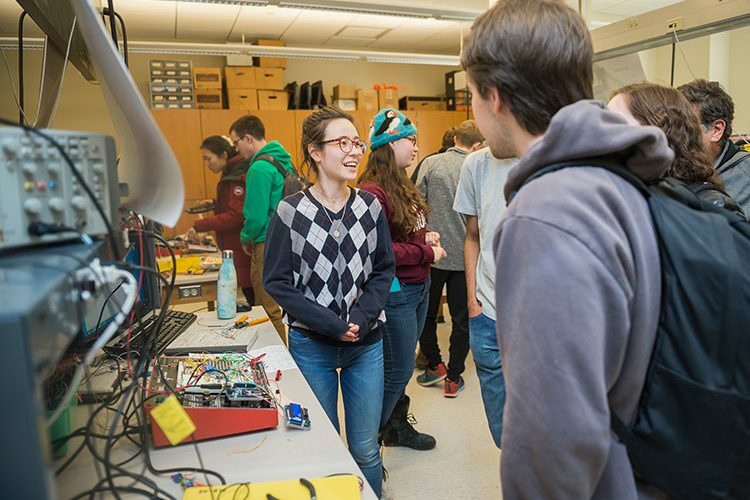 Alina Sabyr ’19, a co-leader of Impulse, talks with students about her project at the Electronics Presentations: Digital Arcade in 2017. Photo by Mark DiOrio. Impulse is a term used in physics to describe a change in momentum, which is exactly what Jillian Belgrad ’17 and Hannah Bercovici ’17 thought the science, technology, engineering, and mathematics (STEM) community at Colgate needed two years ago. They worked with Karen Harpp, professor of geology and peace and conflict studies, to form the organization Impulse. “The goal of the club is to increase diversity and talk about inclusion [in STEM], hopefully signaling change coming in the future,” current co-leader Jocelyne Andrade ’19 said. Andrade has run the organization for the past two years, along with five co-leaders: Alina Sabyr ’19, Faith Williams ’19, Carolyn Senneca ’20, Jenna Taylor ’20, and Rachel Dansereau ’20. The organization formed largely through a community effort to acknowledge and support LGBTQ+ individuals, women, and minorities in the sciences. While many clubs cater to individual areas within the sciences (Colgate Coders, Engineering Club, etc. ), Impulse aims to form a community among all of STEM students. Currently, membership ranges from 60 to 100 students and faculty members each semester. Impulse hosts study breaks, monthly meetings, and addresses the needs of STEM students such as finding study abroad options that don’t delay major completion. They also bring in speakers from underrepresented groups who are doing cutting-edge research. Last year, Impulse speakers included Sasha Ariel Alston, who wrote Sasha Savvy Loves to Code to encourage diversity and female representation within STEM fields, and NASA senior scientist for astrobiology Dr. Mary Voytek, who discussed her research on the potential for life elsewhere in the universe. This November, Impulse is bringing science writer Dava Sobel to campus. She authored The Glass Universe, a novel on the work women at the Harvard College Observatory contributed, largely without recognition, to the field of astronomy in the nineteenth century. Associate professor of physics and astronomy Jeff Bary now uses the novel in his Astronomy 210 course, as well as Sobel’s novel Galileo’s Daughter in his Galileo, Church, and Scientific Endeavors extended study course in Florence. Professor Bary was instrumental in helping Impulse acquire the funding to bring Sobel to campus and hopes students will recognize that, while The Glass Universe focuses on astronomy, it is really about remarkable women in science.